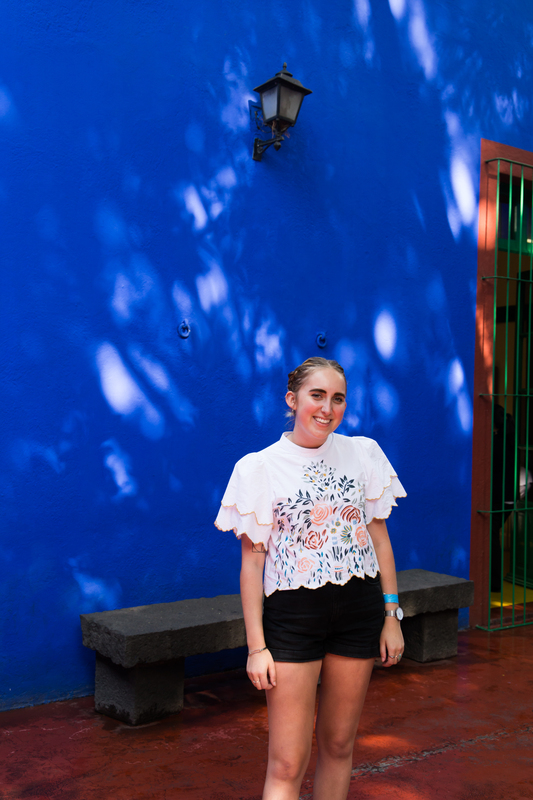 Brothers Eliel and Levi Pizarro López were both born and raised in Mexico, and have been contributing their own murals to Oaxacan walls like this one. After getting permission from a homeowner to paint on her wall, the two set off, knowing that the piece would likely be covered up by authorities within the next 24 hours. Urban art exists around the modern world in many forms - graffiti, sculpture, mural and mixed media, to name a few. Yet perceptions of art in the public space differ from city to city and country to country. As a native of the inner Southeast Portland area, I grew up watching artists cover restaurant walls and garage doors with community murals, but only when I studied abroad in Rosario, Argentina in the summer of 2016 did I begin to question the true communal nature of urban art. As I learned in professor Peter Laufer’s international journalism and storytelling courses, as well as through casual dinner conversations with my Argentine host mother Angie, Latin American history has been marred by cyclical periods of oppression under dictatorships. Throughout the last century, Argentine people and traditions have been threatened by state terrorist groups and authoritarian regimes. Remembered as the Dirty War, the period between 1974 and 1983 brought an especially tremendous loss of life and lack of personal freedom. An estimated 30,000 left-wing activists were “disappeared” - or vanished - because their political beliefs did not align with that of the dictator Augusto Pinochet and his military junta. During these repressive periods, street art arose as a means of communication and memory archiving. Though some of the art pieces are more aesthetic- focused, others are used to comment politically on the state of a place through the eyes of its citizens. 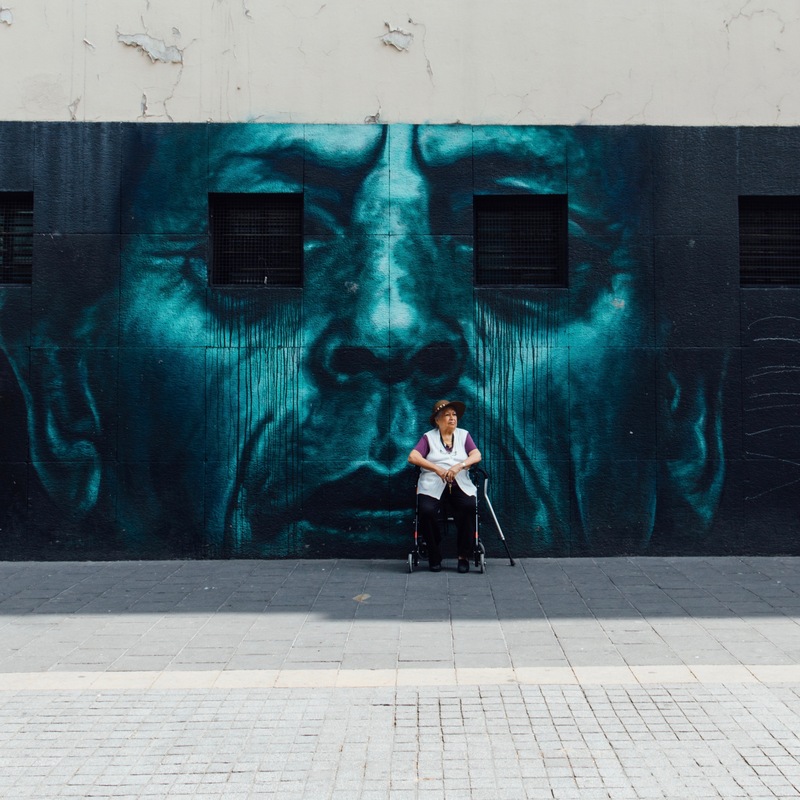 The public walls stretching across the vast and diverse Argentine terrain are meant to be read as texts, some of which communicate sociopolitical contexts more accurately than censored news outlets. In the early stages of my research, I believed the public art scene in Argentina and greater Latin America allowed for a new democratic way of communication and inspired a social dialogue. But the more I read about the very artists creating these public works, the more I questioned my appraisal of the medium. Though the walls have the power to impact cultural memory, their integrity can be threatened by more forces than I had initially considered. This idea, that public art could be manipulated and repurposed as a means to an end, was one of many I chose to explore in Mexico. With a population of more than 8.9 million people, the capital city of Mexico, Mexico Distrito Federal (or Mexico D.F.) is one of the largest in the world, and a Latin American bedrock of urban art. In August of 2017, I traveled to D.F. to expand on my research in another politically charged climate and later visited the more rural Oaxaca as a comparative study. The tumultuous political history of both cities provided a dynamic lens to view my research through - research which was largely conducted via an interview format and catalogued with photography. Through these interviews, I wanted to challenge the western understanding of urban art as a democratic aesthetic, and therefore devised different sets of interview questions for artists and community members. With these questions, I sought to get deeper answers that would speak more to the complexities of art in the public space. My primary questions included: How does the presence of urban art influence the community in Mexico and effect change? Who funds these public projects and how does the source of funding impact the message communicated and the methods used to do so? Can urban art be trusted as the voice of the people, or is it yet another form of corruption? 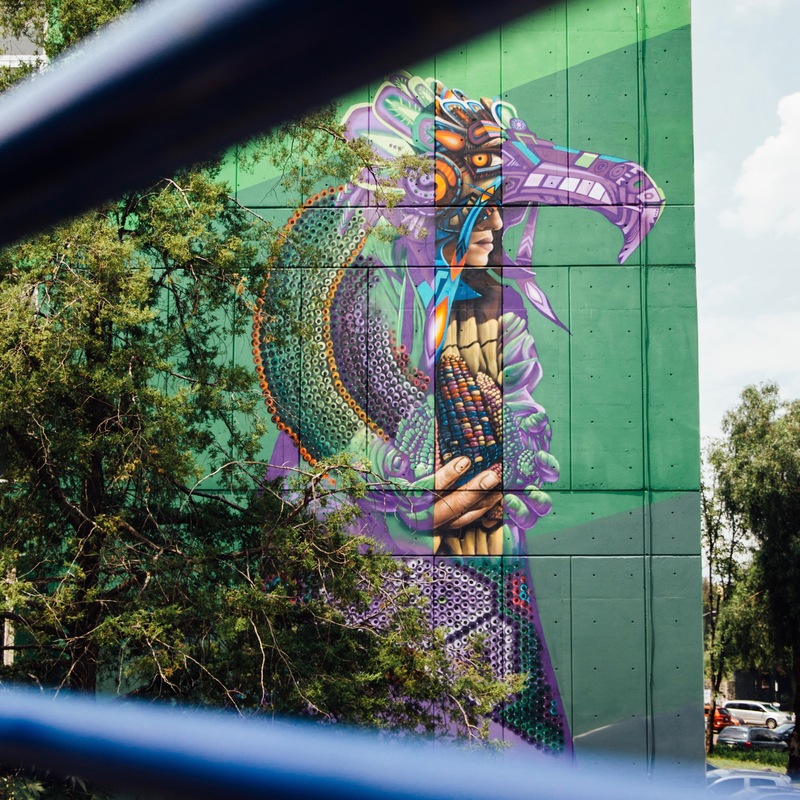 Many of the artworks in even the most urban locations, such as this mural located in a parking garage in Mexico City, depict traditions that passersby will understand and celebrate. This piece features a boy honoring Día de los Muertos, or Day of the Dead, with an alebrije in the form of a dragon — a wooden sculpture carved in Oaxaca — two calaveras (skulls) and a candle, as he reaches past the living world to the immortal one. I interviewed more than a dozen urban artists in person during my three weeks abroad, and have since continued to conduct interviews remotely. Each interview has expanded my area of knowledge and inspired more potential routes to take moving forward. The beauty - and simultaneous difficulty - of a human subjects-based research project is that each subject comes from a unique background and has something different to contribute to the conversation. 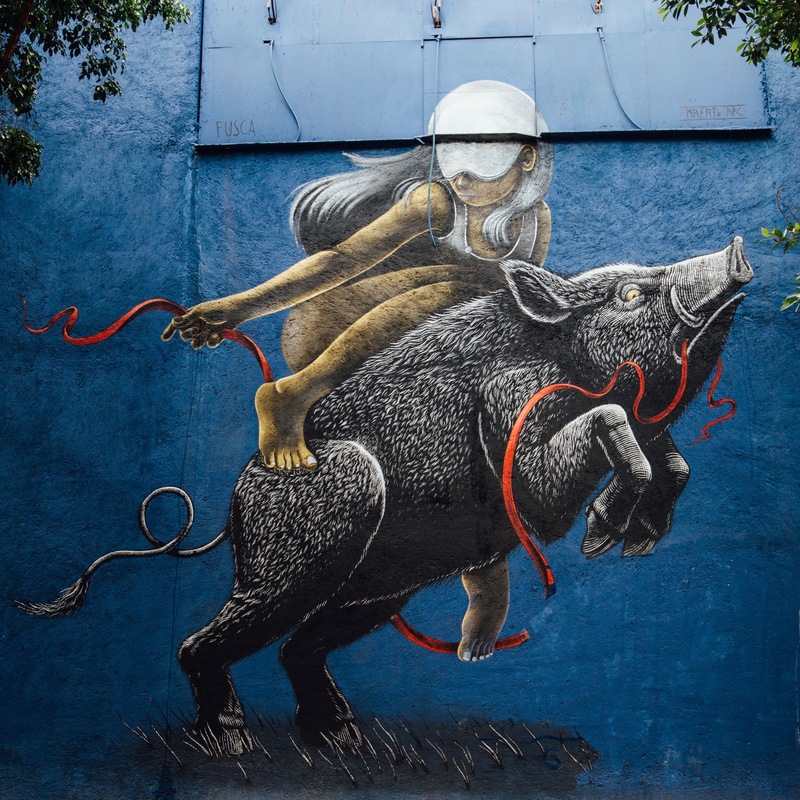 In the case of urban art, different artists have different ideas about the nature of art, particularly about whether it is meant to be political. Keeping various opinions in mind, I aim to ultimately present the state of urban art in Mexico City without defining it or pigeonholing it one way or another. This can only be achieved by bringing in more voices, and with the help of aid applications I am working on, I hope to do so before my thesis defense next year. I plan to travel back to Mexico City and Oaxaca in the coming months to further explore these issues and to create an archive of photographs of urban art. I will continue reading about and researching these topics so as to capture a sense of the many factors at play in public art construction and reception, and welcome anyone interested to reach out (and even attend my winter 2019 defense). 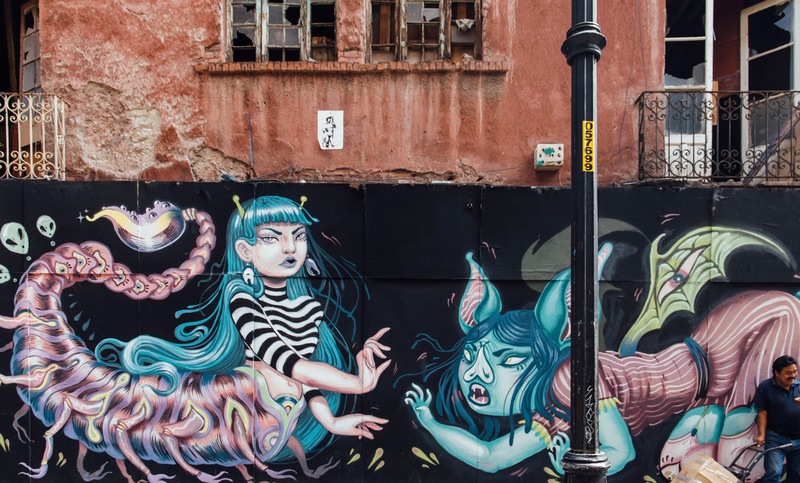 Artists Pilar Fusca and Mazatl often collaborate on mural works, nding that their styles complement each other and benefit their overall design. For this piece, Fusca sketched out and painted the image of the woman, while Mazatl painted the boar she sits upon. The mural faces an elementary school and is surrounded by other works of art students see every school day. 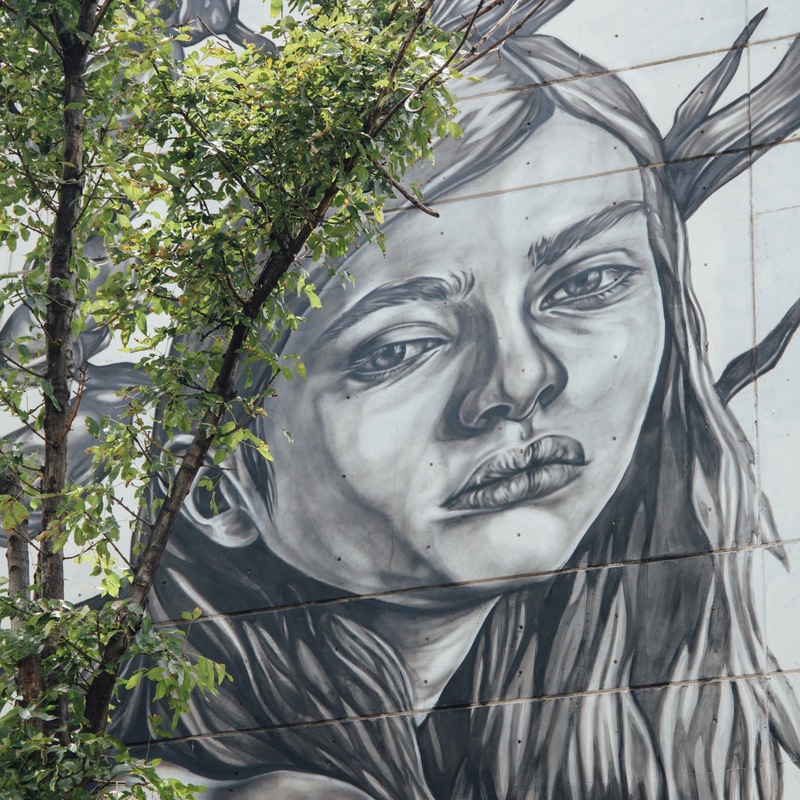 Some neighborhoods in Mexico City are urban art hubs, like that near the University of the Cloister of Sor Juana. Commissioned and independent artworks ll the street-facing blocks, as well as more clandestine spaces like tucked-away parks and fields. After experiencing a rise in rent prices, some building tenants abandoned their multi-level complexes, leaving them unclaimed. 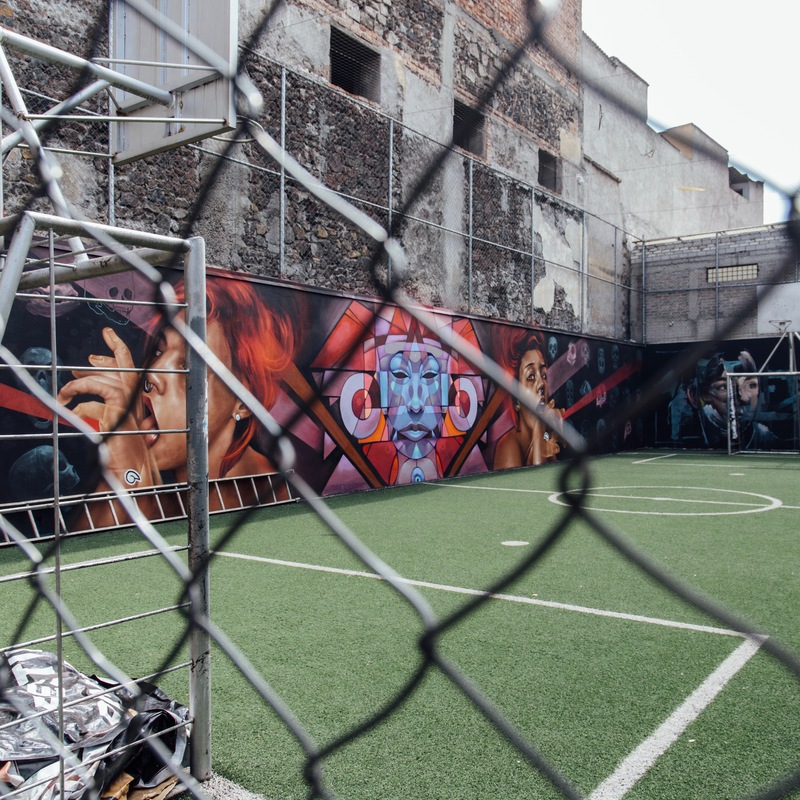 Instead of leaving the buildings to become more decrepit with age, artists on this street in the heart of Mexico City boarded up the first floor and treated the space like their own canvas. This research process has taught me so much about urban art and the power it holds. I have come to believe that in times of struggle, art is perhaps the only thing we can count on to rise from the ashes and help us begin again. The power of art is not reserved to one region or another, but spans to every corner of the world, in the multitude of forms of creative expression. In the case of political turmoil and social injustice, urban art has acted as a platform on which people can speak and present their own points of view. Though these views might be skewed by funding sources and people in power, their physical manifestations nevertheless act as a record of cultural testimony that is perhaps truer than any textbook. Not only has the experience of creating a thesis opened my eyes to the world of street art; it has also helped me recognize my own abilities and affirmed that what I am doing at college matters. For the first time, I see myself as a legitimate scholar - as able to produce work of value - and I feel immense gratitude to the Clark Honors College for that. We are all capable of contributing to the world we live in, and worth taking the time for ourselves to do so. Some artists choose to approach social issues through their work, like Paola Delfin has done with her feminine portraits that are meant to challenge the patriarchy and outdated gender norms. While Delfin was met with great criticism in her early years as an artist, she has since gained recognition for her work and has been own around the world to create commissioned works. 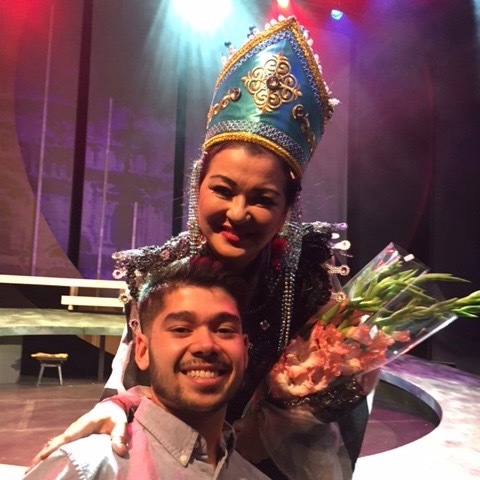 She was even brought to Portland, Oregon in 2017! In many spaces, urban art blends into the overall city landscape, going undetected by some passersby. Artists use a variety of styles when creating their works, many choosing a hyper-realistic approach as a way to prove the technique needed to make compelling urban art. 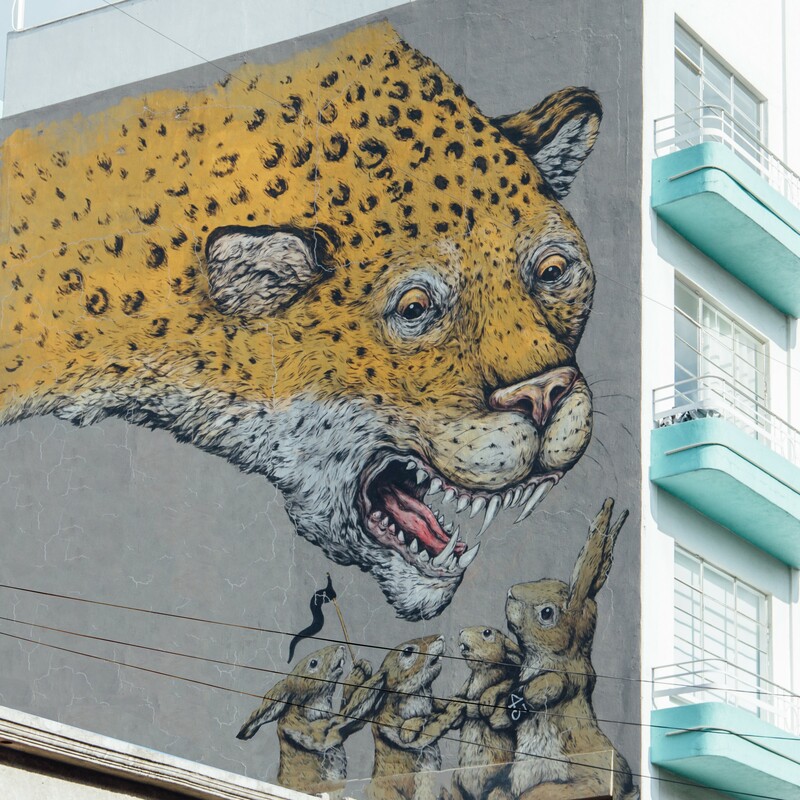 On the outside of an apartment complex only blocks from the Zócalo — the main square of Mexico City — a mural artist voiced their true feelings about the current Mexican government, depicting a tiger looming over a group of rabbits. 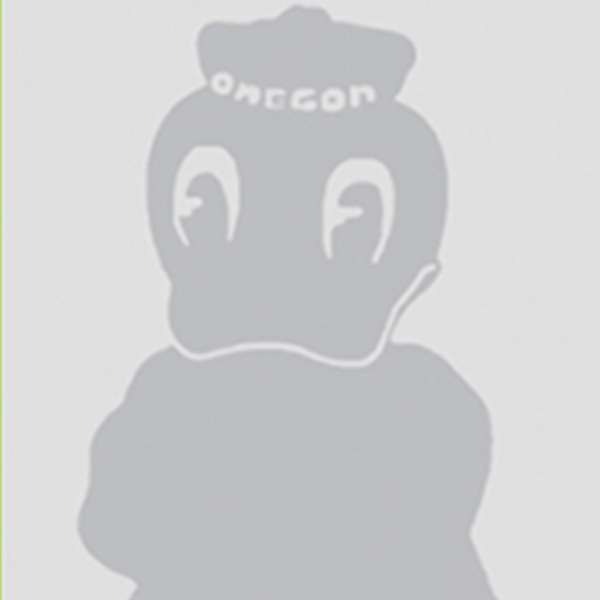 One rabbit wears an armband with the number 48, in connection with the recent student disappearances. Peter Laufer, my thesis advisor and journalism mentor, for challenging me to explore new pursuits in Argentina and for being excited about even my initial ideas. Elizabeth Raisanen, my honors college advisor and guiding light, for encouraging me to apply for the scholarships and grants that made this trip possible. To the Undergraduate Research Opportunities Program (UROP) and to the Arlene E. Cole representatives for their generous grants and scholarships that made this idea a reality. Dagny Daniel, my travel partner and best friend for reminding me that the research process can be fun! My parents, Cindy and Fritz, for being excited about everything - EVERYTHING - I’m up to. It can get old, but I am so lucky to have you. And finally, all the artists who met with me in Mexico and have stayed in touch since. This is all for you! Kendra Siebert is a third year student at the Clark Honors College and is pursuing majors in journalism and advertising, as well as a Spanish minor. She hails from Southeast Portland, the city that kickstarted her early interest in the arts. Kendra spends her time co-directing the Clark Honors College Introductory Program (CHIP) with Mary Vertulfo; serving as Senior Photo Editor at Ethos Magazine, an award-winning student publication; coaching peers at the School of Journalism and Communication’s Writing Central; and strategizing for Allen Hall Advertising, a full-service, student-run ad agency. Honors college students like Kendra can use a little help in making their dreams of study abroad, or research-related travel, a reality. That’s where the Clark Honors College Student Travel Fund comes in. 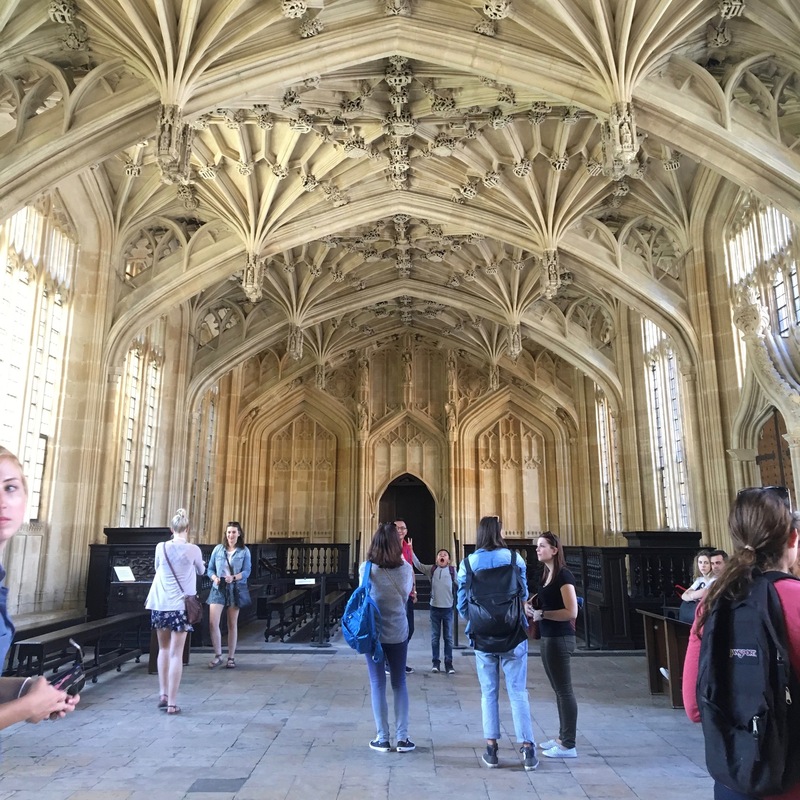 Awards from this fund help cover costs for undergraduate student travel, so that honors college students can participate in a study abroad program, complete their thesis research, or attend a conference or competition. Alumni and friends of the university are invited to support this fund. Our collective goal is to provide each CHC student with the unique opportunity to travel, learn, and excel in their studies – in any corner of the world – no matter what their financial background may be. Established by alumna Genice Rabe ‘72 and her husband Stephen Rabe, the Frank Herbert Mingle Thesis Research Fund provides nancial support to honors college students conducting research for a senior thesis in the humanities or social sciences. The capstone project of a Clark Honors College education, many theses completed during undergraduate years go on to become published scholarly work, or form the foundation of a career. The thesis is a substantial project, requiring rigorous research. Our students dedicate many hours to the development of their thesis, and we strive to honor their effort and commitment by ensuring that they have access to the tools and support they need. Financial resources like the Mingle Fund help make this possible. We invite you to support this fund so that we may provide even more opportunities to our stellar undergraduate students. 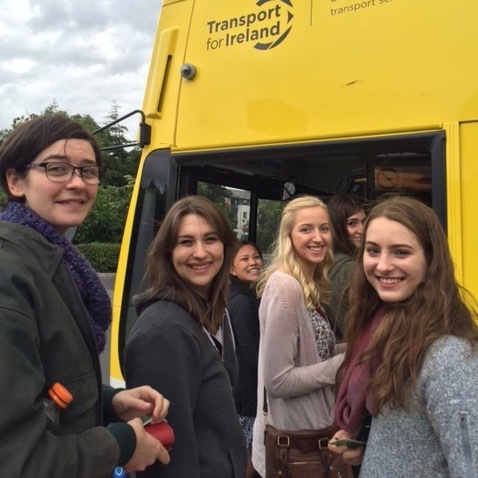 If you are interested in helping honors college students access international experiences, or take their thesis project to the next level, contact Jen Parker for information on how to give [jeparker@uoregon.edu | 541-346-8018]. Alumni support is a critical component in our efforts to provide the best student experience possible.